In this introductory image for his 1983 essay on a collapse of the farm economy, Grey Villet summed up its meaning with the visual metaphor used in the opening spread. This was somewhat atypical, as Villet generally chose to tell his stories in human terms. So, here as a devastating recession comparable to the Great Depression swept through the heartlands, his focus was on Sarah Vogel (at left) a young lawyer who had come home to North Dakota hoping to aid its distressed farmers. 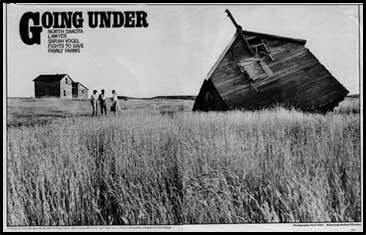 Top: Lawyer Sarah Vogel listens to clients in 1970's North Dakota, Bottom: LIFE Magazine* spread opening Vogel walks with clients through wheat fields near Wing, North Dakota, hoping to plan a strategy to avoid another farm foreclosure. What she found was that the plight of the many farmers who contacted her at a small new office in Bismark, was "much more serious than I had imagined". 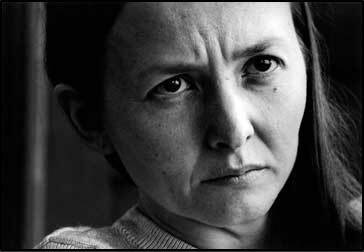 What Grey found was a woman whose face reflected a dedication to her clients that kept her moving through dying towns like Minnewauken, North Dakota (above) where she stopped to report she was running late for a meeting in Jordan, Montana --300 miles from her home. It was there she met Ralph Clark and and his wife (left). After a late night session with them, she agreed to defend them in an Farmers Home debt foreclosure hearing on their 7000 acre sheep and grain operation in Montana the next day. As she had expected, the Clarks lost and Grey caught the stoic moment the farm the family had homesteaded in l913 would go on the auction block. 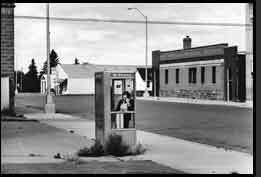 Right: Pre cell-phone 1970's -Vogel makes a stop at a pay phone while in Minnewauken, North Dakota. 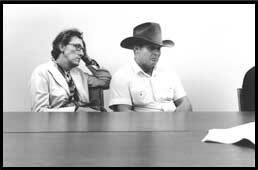 Above left: Mr. and Mrs. Clark listen as they are told that their North Dakota family farm will be foreclosed. *LIFE is a registered trademark of TIME Inc. Essay spreads are copyright to LIFE magazine/TIME Inc./Getty Images.